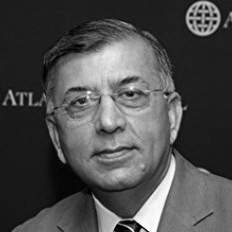 Shuja Nawaz, a native of Pakistan, is currently a distinguished fellow at the Atlantic Council’s South Asia Center. Most recently, he was the Center’s first director. He is a political and strategic analyst. Mr. Nawaz writes for leading newspapers and websites and speaks on current topics before civic groups, at think tanks, and on radio and television worldwide. He has worked with RAND, the United States Institute of Peace, the Center for Strategic and International Studies, and other leading think tanks on projects dealing with Pakistan and the Middle East. He has also advised or briefed senior government and military officials and parliamentarians in the United States, Europe, and Pakistan. Mr. Nawaz was educated at Gordon College, Rawalpindi, where he obtained a BA in economics and English literature and the Graduate School of Journalism of Columbia University in New York. He was a newscaster and news and current affairs producer for Pakistan Television from 1967 to 1972 and covered the western front of the 1971 war between Pakistan and India. He has worked for the New York Times, the World Health Organization, and has headed three separate divisions at the International Monetary Fund (IMF). He was also a director at the International Atomic Energy Agency in Vienna from 1999 to 2001, while on leave from the IMF. Mr. Nawaz was the managing editor and then Editor of Finance & Development, the multilingual quarterly of the IMF and the World Bank. He served on the editorial advisory board of the World Bank Research Observer. He is the author of Crossed Swords: Pakistan, its Army, and the Wars Within(Oxford University Press 2008). He is also the principal author of FATA: A Most Dangerous Place (CSIS, Washington DC January 2009), Pakistan in the Danger Zone: A Tenuous US-Pakistan Relationship (Atlantic Council 2010), Learning by Doing: The Pakistan Army’s Experience with Counterinsurgency(Atlantic Council 2011), and India-Pakistan: The Opportunity Cost of Conflict (Atlantic Council 2014).